Climate change has been defined as an alteration in the state of the climate characterized by variations persisting over time, for a decade or longer. These changes may be caused by human activity or natural factors. The United Nations Framework Convention on Climate Change defines climate change as a stable or permanent change of climate that is caused directly by human activity. This definition emphasizes human activity as the main variable of climate change. Observations and studies have confirmed beyond doubt that the climate is changing, this change being characterized by a steady increase in air and ocean temperatures, melting of ice, rising sea levels, and increases in concentrations of greenhouse gases in the atmosphere. This rise in temperatures is more consistent at northern latitudes, like in the Arctic. North Pole is -40°C in winter and 0°C in summer. Arctic temperatures have increased at almost twice the average rate for the world over the last 100 years. The increase is expected to be from 3°C to 6°C by 2080. This variation is accompanied by decreases in ice sheets and sea ice. Permafrost covers about 24.5% of the land surface in the Northern Hemisphere, the Arctic included. Permafrost is important in the context of climate change because it is extremely sensitive to changes in temperature and the entire Arctic ecosystem depends on it. In the Arctic, both ice sheets and sea ice continue to decrease. Over the last decades, Greenland and Antarctic ice sheets have been losing mass. Arctic glaciers and ice caps have been in decline since the 1960s, with this trend speeding up in the 1990s. In the case of Greenland, maximum surface-melt area on the ice sheet increased by 16% between 1979 and 2002. Melting ice sheets and consequent increase in fresh waters comes with rising sea levels. To that end, the global average sea level rose by 0.19 m over the period 1901-2010. The average decrease in Arctic sea ice between 1979 and 2012 had a rate ranging from 3.5% to 4.1% per decade. The rate grows to 9.4% and 13.6% per decade for the perennial sea ice. Kongsfjorden from Blomstrandhalvøya, Kongsfjorden, Spitsbergen (Svalbard), August 2005. Photo credit: Sphinx, 2007. We mentioned in our first post that the Artic is more exposed to climate change than other biomes and has little resistance to it. Vegetation, wildlife and fish stocks have become adapted to extreme weather conditions and depend on ice and permafrost for their survival. Let us now briefly introduce the Arctic ecosystem. This will help us understand why climate change is impacting the Arctic more than any other biome. The Arctic tundra is essentially characterized by the absence of tree vegetation. Instead, shrubs and vines have adapted to the harsh climatic conditions and freezing temperatures. The Arctic vegetation gets nutrients from a very thin layer of soil and has adapted to live in temperatures right above or below 0°C, and to undergo very short growth seasons in winter. Climate change in the Arctic is causing longer growth seasons, variations in the layers of soil, and a northward shift of the tree line. Overall, climate change is predicted to impact the composition of tundra plants, with the strongest species surviving to warmer living conditions and invasive species outcompeting Arctic resident species. This shift will also cause a reduction in biodiversity at other levels of the food chain. Another effect of climate change on vegetation will be the increased decomposition of plants and production of plant biomass. Combined with higher levels of CO2 in the atmosphere, this will boost the production of Arctic vegetation but, at the same time, change the composition and distribution of species. As with vegetation, wildlife has adapted to a life on ice. 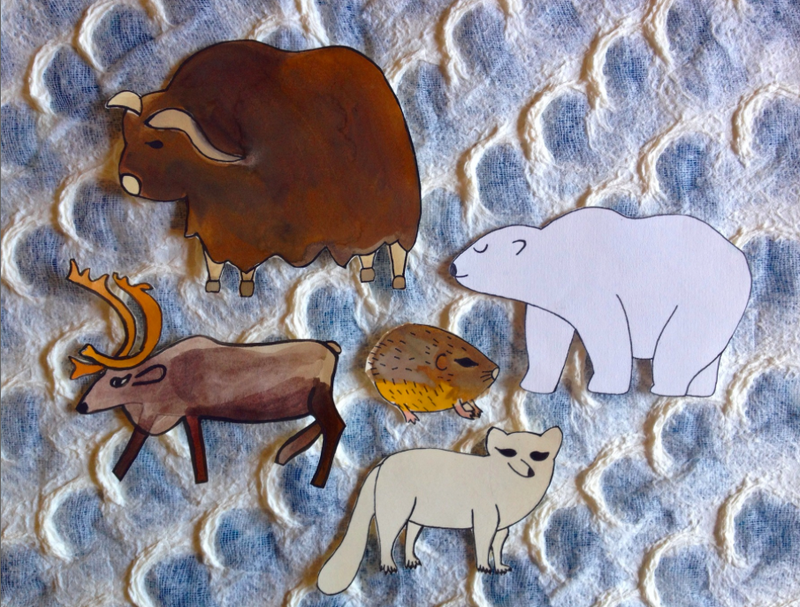 Arctic terrestrial mammals include muskox, reindeer, caribou, fox, hare, wolf, lemming, bear, and more. Marine mammals include whale, porpoise, seal, and polar bear. For insects and herbivores, access to plant food is vital. Changes to vegetation patterns could prevent them from getting access to food, which in turn affects the whole food chain. Predators living in the Arctic are in fact dependent on herbivores for their survival. 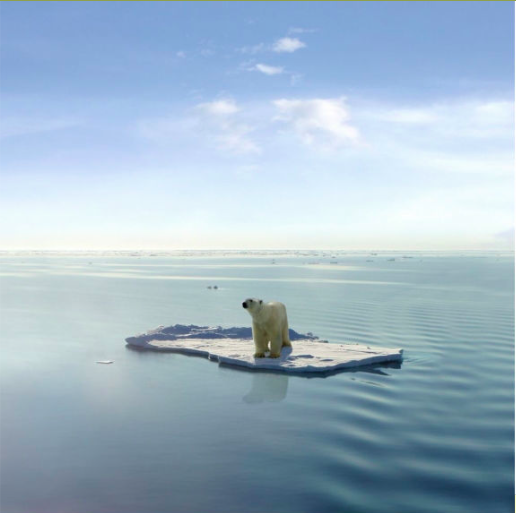 For polar bears, the main threat is the loss of ice cap that allows them to hunt seals at sea. The Arctic Ocean represents a unique marine ecosystem dominated by ice. Covered with ice mostly throughout the year, it is relatively isolated from other oceans and characterized by a complex circulation system. A wide variety of organisms (sympagic organisms, algae, polar cod) live right below the sea ice. Just above the ice sheet, sea birds nest and marine mammals like whales, walrus, seals, and polar bears live. All these species depend on the stability of sea ice in order to obtain food. The water column and the seabed are home to fish, crustaceans, and other marine mammals. What are the risks for the Arctic environment? Climate change risks to cause melting permafrost, increases in short-lived climate pollutants, and ocean acidification. Firstly, permafrost, the layer of permanently frozen soil is melting and thawing, generating instabilities with potentially dramatic consequences for vegetation and wildlife that entirely depends on it. Moreover, scientists believe that melting permafrost will release huge quantities of carbon dioxide (C02) and methane (CH4) into the atmosphere, accumulated in layers of frozen organic materials. Thawing permafrost would start a “positive feedback” loop, where warming climate increases greenhouse gas emissions, in turn reinforcing the existing greenhouse effect. 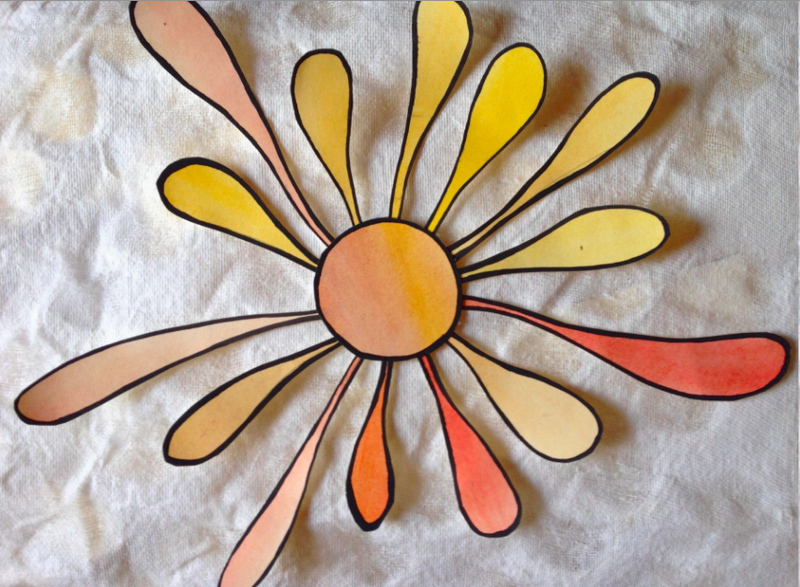 Increased release of carbon dioxide and methane will inevitably change plant composition. Losses in biodiversity are the major consequence of this action and its implications are difficult to predict. Increase in CO2 in the atmosphere also causes ocean acidification. Ocean acidification is described as a reduction in the pH of the ocean waters over an extended period of time. As a result of increased CO2 concentrations in the atmosphere, the ocean takes up more CO2 during gas exchange. Ocean acidification will cause major changes in marine ecosystems. Though it is not yet possible to state how vulnerable the Arctic marine ecosystem will be to acidification, it is likely that some species, like sea grasses and phytoplankton, will benefit from higher CO2 concentrations, while other species could be driven to extinction. In addition, molting and early life stages will be highly exposed to acidification. Overall, we still don’t know how individual species and the ecosystem in general will respond to acidification through acclimatization and adaptation. In addition, changing precipitation patterns, more extreme weather conditions, both in the cold and warm seasons, complete the picture of climate change in the Arctic. Climate change does not stay in the Arctic! Despite considerable knowledge gaps concerning the impact of climate change in the Arctic, we know for sure that these processes will have repercussions elsewhere. Climate change and the challenges connected to it are intrinsically transboundary issues. When talking about the “heat sink” effect, scientists refer to a key function of the Arctic with global repercussions. The Arctic white surface reflects more solar radiation (heat) than it absorbs from the atmosphere, thus keeping the world cool. What would happen if the refrigerator of the planet simply stopped functioning? This is exactly what scientists are worried about. As the Arctic warms up and the sea ice retreats, an increasing portion of Arctic waters will be free from ice and dark in summer. Reduction in albedo (the whiteness of the sea surface) leads to increased absorption of solar radiation, causing the ice to melt even faster! A weaker albedo amplifies climate change not only in the Arctic but all over the world. Last but not least, climate change may also cause rising sea levels as a result of melting ice caps in the Arctic. Despite the lack of historical records, it is possible that on a timescale of centuries and with considerable increase in temperatures, melting ice in Greenland and Antarctic will contribute to significant global sea level rises. The consequences of such events may be far more powerful than we think: stay tuned for the next post, dedicated to the broader impact of climate change in the Arctic! Intergovernmental Panel on Climate Change (IPPC), 2007. IPCC Fourth Report: Climate Change. United Nations, 1992. United Nations Framework Convention on Climate Change. Arctic Monitoring Assessment Program (AMAP), 2011. Snow, Water, Ice and Permafrost in the Arctic (SWIPA): Climate Change and the Cryosphere. Oslo: AMAP. Arctic Climate Impact Assessment (ACIA), 2005. ACIA Overview Report. Cambridge University Press. P. 34. Intergovernmental Panel on Climate Change (IPCC), 2013. Summary for Policymakers. In IPCC, 2013. Climate Change 2013: The Physical Science Basis. Contribution of Working Group I to the Fifth Assessment Report of the Intergovernmental Panel on Climate Change. Cambridge University Press, Cambridge, United Kingdom and New York, NY, USA. Arctic Monitoring Assessment Program (AMAP), 2011. The Impact of Black Carbon on Arctic Climate. Oslo: AMAP. World Wide Fund for Nature (WWF). 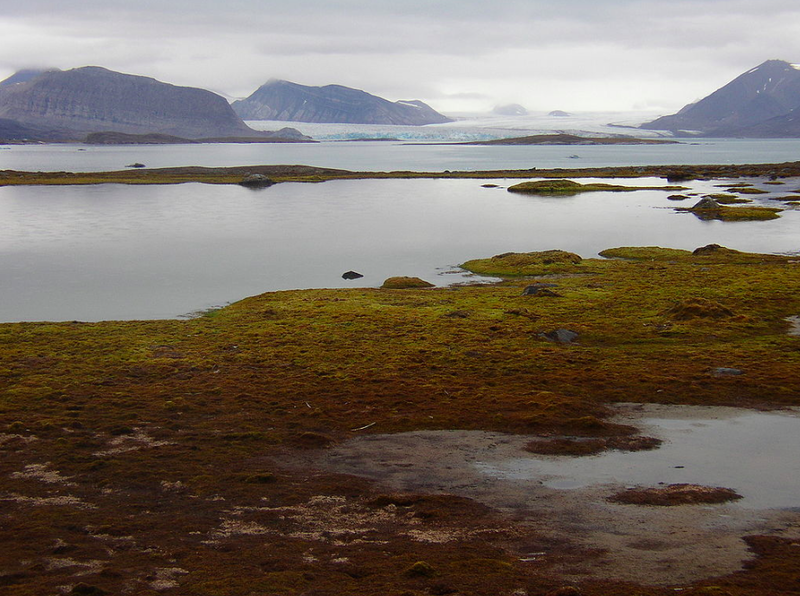 Factsheet Effects of climate Change on Arctic vegetation. Oslo: WWF. World Wide Fund for Nature (WWF). Factsheet Effects of Climate Change on Arctic ecosystem. Oslo: WWF. Arctic Climate Impact Assessment (ACIA), 2005. ACIA Overview Report. Cambridge University Press. Intergovernmental Panel on Climate Change (IPPC), 2011. Workshop Report on Impacts of Ocean Acidification on Marine Biology and Ecosystems. Arctic Monitoring and Assessment Program (AMAP), 2013. AMAP Assessment 2013: Arctic Ocean Acidification. Oslo: AMAP. P. 54.